UPDATE 8-13-03: Valida joins the Neo Pack! This is Valida. I was supposed to foster her for rescue but Chopper and I have decided she's staying. She's a tiny girl for a Neo, and very sweet. UPDATE 4-29-09: I still remember when her surrender-profile came into rescue. I thought, "No way this dog is adoptable." 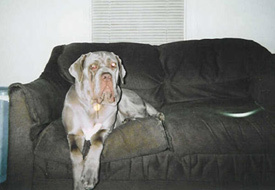 She was terrorizing a household of dogs, cats, and small children. When I was asked to foster her I didn't want to, but agreed to take her in for a bit, as she had no place else to go. I must have had sucker written all over me. I was the only one surprised when I decided to keep her. By that time it would have been like ripping out a piece of my heart and sending it away. 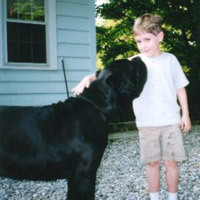 She wasn't a good dog, she was a great dog. Did everything I ever asked of her: Top Neo in 2007 in rally obedience, proficient tracker, carried my purchases at the farmer's market, accompanied me to the coffeehouse every weekend morning, and, of course, my companion and protector at all times. She was exceptional in every way so maybe it follows that she developed a rare illness. When walking became torture I had to let her go and that piece of my heart sure enough went with her. I will never forget her. 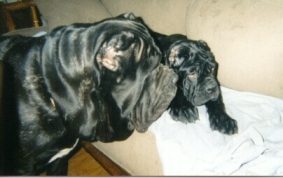 UPDATE 7-17-02: Minerva and Juno of the mighty Neo Pack check in. Check it out! 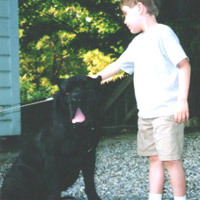 Maybe man's best friend is dog because dog's best friend is boy. 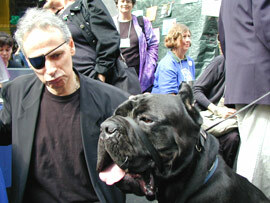 Juno takes Best in Show at the Cherry Blossom Classic in Washington, DC. 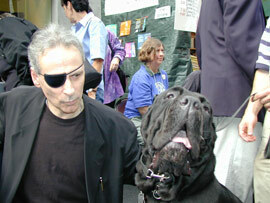 UPDATE 9-27-00: Minerva and Joseph Steinfeld visit Andrew Vachss at New York is Book Country, September 24, 2000. 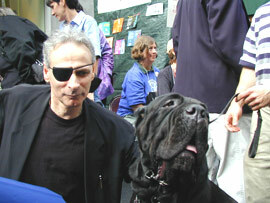 The Black Orchid hosted Andrew Vachss at New York is Book Country, and was delighted when Joseph Steinfeld showed up unannounced with his prize-winning Neo, Minerva. Big thanks to Wendy Reynolds for the outstanding photography! 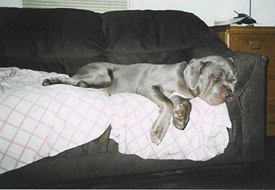 This is a more current photo of the Neo Pack's Isabelle (aka Blue Belle). 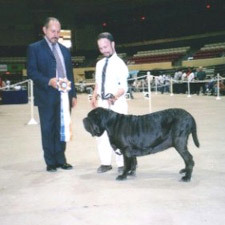 Following in the footsteps of her parents, Champion Blanch-o Samson and Champion Ironstone Juno, she is shown here taking "Best of Winners" at the 1999 US Neapolitian Mastiff Club National Specialty, held in Cape Cod. 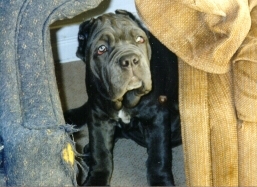 Joseph Steinfeld is proud to be associated with these three champion Neopolitan Mastiffs: Minerva, Isabella, and their mother Juno. 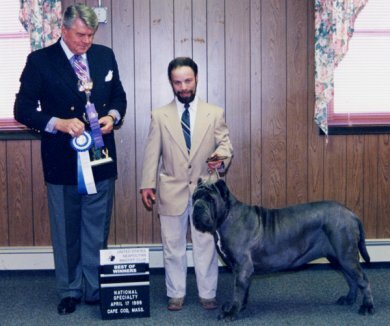 Juno is a registered Champion with both the US Neopolitan Mastiff Club and the American Rare Breed Association; Minerva won the Cherry Blossom Classic, the largest rare breed show in the US; and baby Isabella has never been beat in her age group. 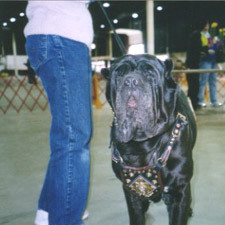 The Neopolitan Mastiff is a rare breed today—fewer than 10,000 are registered—but they date back to the days of the Romans. The Roman troops would take the Neos into war with them—their modern equivalents are called "Sherman tanks." Just as Neos were the guard-dog of choice for Italy's palaces, Steinfeld feels (justifiably) his home is safe with Juno and crew. 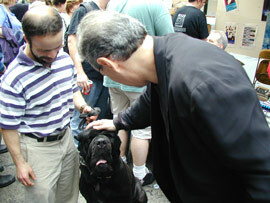 "They've never eaten anyone that I know of, but, then, I doubt that they'd leave behind any evidence," said Steinfeld.